Minimum time: 2-3 months of thorough training. General: Basic understanding of Dojo etiquette. Fitness: Marked improvement of flexibility. Endurance test: 3 min. Kin Geri from Fudo Dachi with change. Basic positions: Yoi/Fudo Dachi, Heisoku Dachi, Heiko Dachi, Musubi Dachi, Zenkutsu Dachi. Arm blocking techniques: Seiken Jodan Age Uke, Mae Seiken Gedan Barai, Kakewake Uke. Arm attack techniques: Oi Seiken (Gedan, Chudan, Jodan) Tsuki, Morote (Gedan, Chudan, Jodan) Tsuki. Foot techniques: Hiza Geri, Haisoku Kin Geri. Kata: Kihon Kata Ichi (Gedan Barai), Kihon Kata Ni (Jodan Age Uke), Kihon Kata San (Mae Geri Chudan Chusoku), Taikyoku Sono Ichi. Oral exam: General knowledge of style (founder, object emblem, etiquette, dojo, dogi, kihon, terminology used up to the relevant level). 3-6 months of thorough training. Basic knowledge of Kyokushin history and about Sosai Masutatsu Oyama. Basic skill in partial participation in the body warm up sequence. Improvement of general strength and flexibility. Endurance test: 4 min. Chusoku Chudan Mae Geri – Fudo Dachi with change. Seiken Chudan Soto Uke, Seiken Chudan Uchi Uke, Seiken Juji Gedan Barai. Seiken Gyaku Tsuki (Gedan, Chudan, Jodan), Seiken Ago Uchi. Kyokushinkai history, dogi-folding, belt-knot, definition of Taiso, definition of Kata, Kihon kata, Taikyoku Kata, terminology used. Minimum time: 6-9 months of thorough training. General: Oral and written exams. Average knowledge of Kyokushin history and Mas Oyama. Fitness: Participates to the full body warm-up sequence. Additional improvement of general strength and flexibility. Endurance test: 6 min. Chusoku Jodan Mae Geri –Zenkutsu Dachi movement. 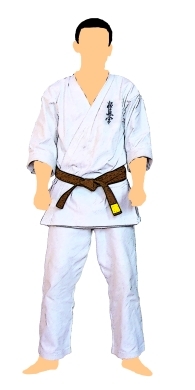 Basic positions: Kiba Dachi (90, 45), Kumite Dachi. Arm blocking techniques: Seiken Chudan Morote Uke, Seiken Chudan Uchi Uke/Gedan Barai, Mawashi Gedan Barai. Arm attack techniques: Seiken Tate Tsuki (Gedan, Chudan, Jodan), Shita Tsuki, Seiken Jun Tsuki. Foot techniques: Chusoku Jodan Mae Geri, Haisoku/Chusoku Gedan Mawashi Geri, Sokuto Kansetzu Geri. Minimum time: 9-12 months of thorough training. General: Slightly better knowledge of terminology in Japanese. Able to perform techniques on command. Fitness: Participates to the full body warm-up sequence. Actual improvement of strength, flexibility and performance of various endurance workouts in 2 minutes. Endurance test: 4 min. Mae Geri Keage, 4 min. Yoko Geri Keage, both from Zenkutsu Dachi with change. Basic positions: Neko Ashi Dachi, Uchihachiji Dachi. Arm blocking techniques: Shuto Mawashi Uke. Arm attack techniques: Tettsui Oroshi Uchi, Tettsui Kome Kami, Tettsui Hizo Uchi, Tettsui Mae Gedan, Tettsui Yoko Uchi (Gedan, Chudan, Jodan). Foot techniques: Mae & Yoko Geri Keage, Teisoku Soto Mawashi Geri Keage, Sokuto/Haisoku Uchi Mawashi Geri Keage, Chudan Yoko Geri. Special technique: Yakusoku Ippon Kumite – Self-defense. Oral exam: Current structure in Kyokushin Karate, definition of Pinan, Origin, signification, signification of Kime, Kiai, OSU, Terminology used at the relevant level. Minimum time: 12-18 months of thorough training. General: Written and oral test. Recites Dojo Kun. Fitness: Actual improvement of strength and flexibility.. Endurance test: 5 min. Chudan Mawashi Geri, 5 min. Chudan Yoko Geri – movement Kumite Dachi. Basic positions: Tsuru Ashi Dachi. Arm blocking techniques: Seiken Juji Uke (Gedan, Jodan), Osae Uke, Sukui Uke. Arm attack techniques: Uraken Shomen Uchi, Uraken Sayu Uchi Uraken Yoko Uchi, Uraken Hizo Uchi, Uraken Oroshi Uchi, Uraken Mawashi Uchi, Nihon Nukite Jodan. Foot techniques: Haisoku/Chusoku Chudan/Jodan Mawashi Geri, Sokuto Jodan Yoko Geri, Ushiro Geri (Gedan, Chudan) Kakato. Written-oral exam: Dojo Kun, Okinawa Kobudo – general, object, Go Shin Jutsu Signification, terminology. Self-defense: 4 reaction modalities against grips and attacks. Tameshiwari: Seiken, 1 board; Mae Geri, 1 board. Minimum time: 18-24 months of thorough training. General: Advanced knowledge of terminology in Japanese. Ability to explain/ learn fundamental techniques. Fitness: Actual improvement of strength and flexibility. Endurance test: 6 min. Chusoku Chudan Mawashi Geri, 6 min. Ushiro Geri – both movement in Kumite Dachi. Basic positions: Moro Ashi Dachi-versions of movement. Arm blocking techniques: Shotei Uke (Gedan, Chudan, Jodan); Jodan Age Uke-Gedan Barai, Chudan Soto Uke-Gedan Barai. Arm attack techniques: Shotei Uchi (Gedan, Chudan, Jodan), Yohon Nukite (Chudan, Jodan), Jodan Hiji Ate. Foot techniques: Jodan Kakato Ushiro Geri, combination Mae Geri Chudan Chusoku–Chusoku Chudan Mawashi Geri – Ushiro Geri Chudan Kakato. Special technique: Renraku 3 (Mae, Yoko, Ushiro Geri-Gyaku Tsuki) Go Shin Jutsu, Gyaku Te. Kata: Pinan Sono San; Sanchin No Kata (informal, emphasis on the arm technique, the movement technique and breathing). Written-oral exam: Tonfa, Bo, introduction, history, use. Rules of Kumite Knock Down – details, Tatami etiquette, terminology used. Self-defense: 6 modalities of reaction against grips and attacks. Minimum time: 24-36 months of thorough training. General: Written and oral exam. Begins to assist and Assistant Traitner in the course and running of training classes. Endurance test: 7 min. Jodan Mawashi Geri in Heiko Dachi, 7 min. Mawashi-Yoko-Ushiro Geri in movement Kumite Dachi (version Mae-Mawashi-Ushiro Mawashi). Basic positions: Uchi Hachi-ji Dachi, Heisoku/Heiko Dachi. Arm attack techniques: Shuto Yoko Ganmen Uchi, Shuto Sakotsu Oroshi Uchi, Shuto Sakotsu Uchi Komi, Shuto Naka Uchi (Shuto Jodan Uchi Uchi), Shuto Hizo Uchi, Morote Haito Uchi. Foot techniques: Ushiro Mawashi Geri, Combination Mae-Mawashi-Ushiro Mawashi Geri. Special technique: Go Shin Jutsu (Self Defense), Gyaku Te, Tomfa – grips, handling, Uke (Jodan, Chudan, Gedan), Uchi, Tsuki. Kata: Sanchin No Kata (formal, Ibuki and body testing). Written-oral exam: Nunkeaku, presentation Sai, history, use. Rules of Kata competitions – details, definition, Sanchin No Kata. Self-defense: 8 modalities of self-defense against grips and attacks. Tameshiwari: 2 boards using arm techniques, 2 boards using foot techniques. Minimum time: 2 1/2 – 3 years of thorough training. Sufficient improvement of speed and strength in the performance of the techniques. Furtherance of the improvement in the performance of the techniques as well as their coordination with the body biomechanics. Endurance test: 8 min kakato Soto Oroshi Geri, Kakato Uchi Otoshi Geri (movement Kumite Dachi). Basic positions: Kake Ashi Dachi, Shiko Dachi. Arm blocking techniques: Shuto Juji Uke (Gedan, Jodan), Koken Uke (Gedan, Chudan, Jodan). Arm attack techniques: Chudan Hiji Ate, Hiji Age (Chudan, Jodan) Ate, Hiji Mae (Chudan, Jodan) Ate, Hiji Oroshi Ate, Hiji Ushiro Ate, Hiji Sayu Ate. Foot techniques: Kakato Mae Geri (Gedan, Chudan, Jodan), Kakato Soto Otoshi Geri, Kakato Uchi Otoshi Geri. Special technique: Go Shin Jutsu, Gyaku te, Bo-prize, manuire, Uke (Gedan, Chudan, Jodan), Uchi, Tsuki. Written-oral exam: The code of the martial arts practitioner. Non-violence basic training principle, fundamental principles that marked the evolution in Karate. Self-defense: 10 modalities of self-defense against grips and attacks. Minimum time: 3 1/2 – 4 years of thorough training. General: Written and oral exam. Essay on various topics. Skills and knowledge of command use and running independently a training session. Endurance test: 4 min. Tobi Mae Geri, 4 min. Tobi Nidan Geri, both in movement Kumite Dachi). Basic positions: Kosa Dachi. Shumoku Dachi. Tachi No Kata with all the explanations of each element. Arm blocking techniques: Haishu Uke, Kake Uke (Chudan, Jodan). Arm attack techniques: Haishu Uchi (Chudan, Jodan), Koken Uchi (Gedan, Chudan, Jodan, Shomen, Mawashi), HirakenUchi (Chudan, Jodan, Mawashi, Otoshi), Age Uchi, Ryutoken. Foot techniques: Mae Oroshi Kakato Geri, Tobi Mae Geri, Tobi Nidan Geri. Special technique: Go Shin Jutsu, Gyaku Te, Ko-Budo: Tonfa Kihon Kata 1-4, Renraku 4. Written-oral exam: Definition, origin of Gekisai Dai Kata. Thameshiwari: definition, importance, principles. Running the training. Taiso. Self-defense: 10 modalities of self-defense against various attacks, followed by throwing and completion on ground. Tameshiwari: 3 boards using 1 arm technique, 3 boards using 1 foot technique. Written and oral exam. Skill and knowledge of use of commands and running independently a training session. Thorough knowledge of most of the techniques and commands in Japanese. Endurance test: 5 min. Tobi Yoko Geri, 5 min. Jodan Uchi Haisoku Geri (both in movement Kumite Dachi). Basic positions: Skill to move quickly through all the position, easily; excellent shape. Good transition when going through various positions. Arm blocking techniques: Tensho, both forms, inward and outward, and various applications. Arm attack techniques: Hitosashi Yubi Ippon Ken, Naka Yubi Ippon Ken, Oya Yubi Ippon Ken, Toho, Keiko. Foot techniques: Tobi Yoko Geri, Jodan Uchi Haisoku Geri, Oroshi Soto Kakato Geri, Oroshi Uchi Kakato Geri. Special technique: Go Shin Jutsu, Gyaku Te, Ko-Budo: Kihon Kata 1-4 No Bo, Renraku 5-6, Bokken Techniques. Definition, origin of Yantsu, Tsuki No Kata. Thorough knowledge of terminology, commands and etiquette in Dojo. Details on the terminology used, versions, opinions, guidelines on the performance of techniques, necessity of harmonization. Conditions: Assistant trainer, instructor, trainer. In special situations, the Black Belt College can approve examination even if the above-mentioned conditions are not met. Self-defense: Modalities of self-defense against various attacks with stick, knife or multiple opponents. Tameshiwari: 4 boards using 1 arm technique, 4 boards using 1 foot technique. Minimum time: 4 1/2-5 years of thorough training, with minimum 1 year in the 1st kyu degree. General: Black belt – A return to the beginning; beginning as Yudansha degree. “Shodan” – the Beginner’s Degree. “Shoshin” – the Beginner’s Mind. SHODAN conditions: The candidates approved for exam must pay upon signing up the sign-up fee to their instructor, which will be sent to the organization, together with the specific documents. A copy of the Sign-up Form will be forwarded through the instructor to the Zone Branch Chief and later to the Regional Manager. After the exam and the successful promotion as black belt, the candidate shall prepare 2 (two) passport photos and the necessary documents and corresponding fee will be sent to Honbu in order to obtain the Shodan certificate and the belt embroidery. To master full and thorough knowledge of the History of Karate Kyokushin and Mas Oyama. To have experience in the last year as member of a staff or organization committee for a competition or tour, or as official referee, fully active throughout the last 12 months. To bring proof of participation as assistant to the organization and occurrence of various events or tours of any dojo or organization of IKOK Sosai to which they belong. To be the initiator or part of an initiating group of founding a dojo, separately or as satellite of the dojo to which they belong, maintaining permanent contact with their instructor. Summary and report: The candidate must submit, with the Sign-up Form, a typed report of at least 4 (four) pages, which should include details about: their personal history; aspects on the stage of the current training; future plans; influence Karate has had on their personal life. Certificates: Exam certificates (2nd Kyu and 1st Kyu). Endurance and cardiovascular workout: Foot technique per the commission’s request. Arm blocking techniques: Morote Kake Uke – (Gedan, Jodan, Chudan), Ryusui Uke, Geri Uke. Arm attack techniques: Morote Haito Uchi (Jodan, Chudan), Haito Uchi (Gedan, Jodan, Chudan), Ude (Kote) Uchi. Foot techniques: Jodan Kake Geri (Kakato, Haisoku), Age Ushiro Kakato Geri, Tobi Mawashi Geri. Special technique: Go Shin Jutsu, Gyaku Te, Ko-Budo: Taikyoku Sono Ichi No Bo, No Tomfa, Renraku 7. Taikyoku 1-3 and Pinan 1-5. Kumite: 30 (optional for ages +35 years). Definition, origin of Yantsu, Tsuki No Kata. Thorough knowledge of terminology, commands and etiquette in Dojo. Detais on the terminology used, alternatives, opinions, guidelines on the execution of techniques, necessity of harmonization. Conditions: Assistant instructor, instructor, trainer. In special situations, the Black Belt College can approve examination even if the above-mentioned conditions are not met. Self-defense: Spontaneous modalities of self-defense in various situations that may occur.